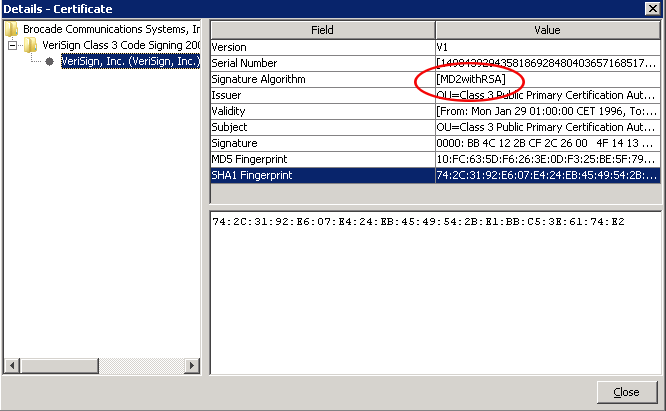 A detailed look into the certificate shows that a signature algorithm MD2withRSA was used to create it. MD2 is disabled in java by default also a RSA key with less then 1024bits. Because these are no longer considered as secure and therefore java reject such certificates. The applet should start now but for security reasons it is recommended to reverse this change if it is no longer needed. You saved me hours of troubleshooting!!! This was incredibly helpful.. thanks! This despite the fact that I already added the URL of the switch to the Exception Site List in Control Panel. The Java docs say that should be enough to bypass this security check (http://java.com/en/download/help/jcp_security.xml), but there must be some other step I’m missing. Any ideas? Yes, unfortunately, I have tried that to no avail. Adding the URL to the Exception Site List has indeed worked for me for other equipment, such as Navisphere. But on my Brocade running 6.3, it doesn’t clear up that error message. I’ll let you know if I find a solution. For java 8, try not to comment the line “jdk.certpath.disabledAlgorithms=MD2, RSA keySize < 1024' " , but to change 1024 by 256 . It worked for me. Its worked for me ,thanks bro . The only thing I have found to solve this problem is to stay on Java 7 and turn it to “Medium” security. Frustrating, but at least it works. Hi, how do i find java.security file in my computer.? And where do i comment after searching the file if its a security file. how to open that file? read the javahome key from the registry. Open a command prompt (cmd.exe) and execute. What do you mean my “comment the following”, where should I put the code??? set a hashtag # at the begin of a line. This marks the line as a comment and the line is ignored by java. you have to start your editor with administrator rights to open the file. I did the same, still it doesn’t help? Im still getting the same error. Have you also checked the file attributes? Is the read-only attribute set? but where should i put the comment? ‘# jdk.certpath.disabledAlgorithms=MD2, RSA keySize < 1024' ? Works like a charm! 🙂 Thanks for this! I logged in as an administrator and unchecked the read only tab. still not allowing me to amend it. bdy i am trying to open the file with wordpad. is it okay?? or thats what m doing wrong? thanks for your response and attention. actually I am quite a novice ammongst you all. thanx u are a live saver!!! Michael, This is working in my other colleagues profile but for me i get this error,I have trying this on a shared window server through Remote Desktop and do not have access to the security file to change, is there any profile changes should i suggest to my windows admin or any entry to the specific file. AFAIK java security can be overwritten within a user profile but this has to be enabled by the administrator of the machine. I think you have to contact your Windows Admin. I commented the line in a Windows 10 preview having this issue but still receive the error. I run Jre1.8.0_31. The Certificate Details show the algorithm is SHA1withRSA. Can you see a solution? have you also tried to add the URL to the “Exception Site List” in the “Java Control Panel” Security Tab? Subject CN=”Oracle America Inc.” etc. It is windows 10 preview but would be great to see we can get this working. have you also disabled the certificate revocation checks for signed code and TLS? or are other comments needed? The revocation checks can be disabled at the Java Control Panel. Leave it and do not specify any parameter after the equal sign, because when the parameter arn’t defined I do not know which default values java sets. then you have to add both to the exception list. After adding the URL to the exception all apps should start perhaps with some warnings but they start. Have you more details about the certificate? Expiration day, Key Size…? 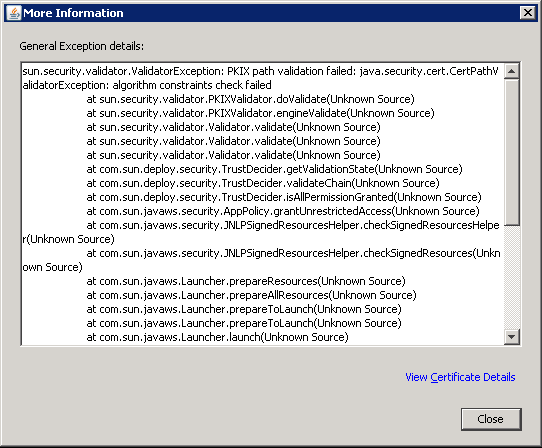 The revocation checks can be disabled the Java Control Panel. Do I need to restart the machine after commented this line, “jdk.certpath.disabledAlgorithms=MD2, RSA keySize < 1024" for Java 8. Is there another alternative for Java 8 ?. Please share. Then your problem is solved. Although its not recommended “by Java”. Your solution worked for me, thanks a lot…You da man! **Important – Check your computer time, date and time zone first. If any of these settings are wring, this can cause this same error to occur! Thank you SO much, you saved my behind! worked for me. You are really genius . I’m having a similar issue but the signature algorithm shows [SHA1withDSA]. Is there anything I can do with this? I am getting similar issue with signature algorithm [SHA1withRSA]. Any solution is appreciated. I have the similar issue for SHA1withRSA. As you told, I already added to Exception list in JAVA. and Internet explore trusted sites also. could you please help on that issue. Michael you’re the real MVP, thank you so much! I’m facing the same Application blocked for security “Failed to validate the certificate” error. I’m running Java 8u101 on Windows 7 and IE 11. I’m facing this error for all the sites where I’m requested to load Java Applets. Is it due to any specific reason I’m facing this error ? I am having similar issue like Lex. It still shows the failure message. I tried all that you recommended. 4. Added IP address to the exception list. The same works when I role back to Java 6. The certificate details are as below. Please let me know if you have any other suggestion. Your solutions has saved me quite really.. In some cases the error appears on repeated attempts to install Voyant and they are unable to complete the installation. solved my problem.. Thanks a lot!! !